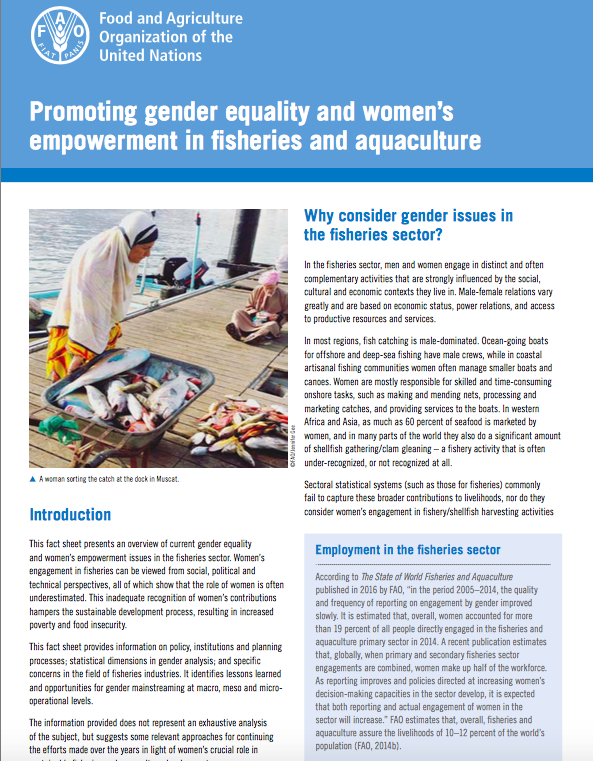 This factsheet presents an overview of current gender equality and women’s empowerment issues in the fisheries sector. Women’s engagement in fisheries can be viewed from social, political and technical perspectives, all of which show that the role of women is often underestimated. This inadequate recognition of women’s contributions hampers the sustainable development process, resulting in increased poverty and food insecurity. This factsheet provides information on policy, institutions and planning processes; statistical dimensions in gender analysis; and specific concerns in the field of fisheries industries. It identifies lessons learned and opportunities for gender mainstreaming at macro, meso and micro-operational levels.